How can NB-IoT provide for the impressive coverage enhancements compared to legacy LTE? Why are there 3 different uplink implementations in NB-IoT? Single-tone 3.75 kHz and 15 kHz and multi-tone 15 kHz? On which bands does NB-IoT operate? How does the OFDMA-grid look like with NB-IoT? Where are the NPDCCH etc. located? Why does NB-IoT deploy so-called blind repetitions and what are the implications of using them in terms of throughput rate and latency? What are typical battery life times of NB-IoT under different conditions? How to calculate them? 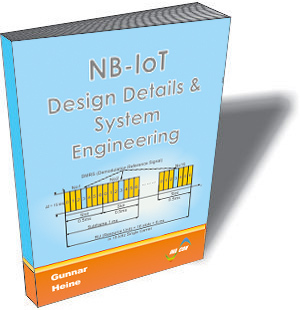 How can short messages be delivered to NB-IoT UE's without telephone number? Which performance in terms of coverage and throughput rate does NB-IoT provide under different conditions? Does NB-IoT use turbo coding and HARQ? Which new channels does NB-IoT introduce and how do they differ from their wide band ancestors? What are the differences between PSM and eDRX and how do both operate? How does NB-IoT provide for downlink access to the UE? What are typical delay times? To which degree can the operation of NB-IoT be controlled by the UE and by the operator? Which new BCCH-messages does NB-IoT introduce and what is their content?